I just can’t bring myself to bother with canned pickles, because we find them to be mushy and lacking in bright flavor – that is not an issue with Refrigerator Garlic Dill Pickles. Rather, these pickles are, once they have a chance to ferment for a couple days, kept in the refrigerator, where they stay fresh and safe to eat for months. 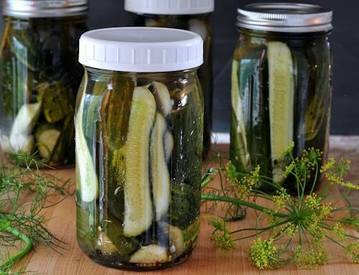 Because you aren’t canning, these are super easy to make. The brine uses just a few common ingredients, along with some fresh garlic cloves and dill, both of which are very easy to find this time of year. I can get a batch of these finished up in about 30 minutes, and then all we have to do is sit back and wait for the magic to happen.